Sixth Avenue opened its first store on Manhattan's Sixth Avenue in New York City in 1984. The company opened its first suburban store in 1989, on Route 4 in Paramus, New Jersey, after which it began to evolve into a chain of upscale suburban showrooms, moving its corporate headquarters to Springfield in 1991. In the past few years Sixth Avenue Electronics has been concentrating on building a large internet presence, bringing the best deals in electronics to the worldwide online shopping market. For customer service inquiries or to initiate a return, please contact 6 Ave at customercare@6Ave.com or 800-927-1491. You can initiate a return for new and unopened items within 15 days of delivery for a refund. To qualify for a refund, items must be in new and unused condition with all original materials and/or accessories. If a return is not received at our processing facility within 30 days, it may be subject to a partial refund. You will be responsible for return shipping costs. However, if the return is a result of a fulfillment error, product defect, or damage incurred during shipping, we will refund the full cost of the merchandise. We will provide a pre-paid return shipping label for Non-Buyer's Remorse returns. All returns are subject to inspection, and if found not to be an error on our part, the return shipping costs will be withheld from your refund. SPECIAL RETURNS INSTRUCTIONS: The Seller charges a restocking fee of 20% that will be withheld from the refund. The Seller will issue a partial refund up to 50% for used or non-restockable items. Want to wow the crowd and freak 'em out with your otherworldly guitar sounds? 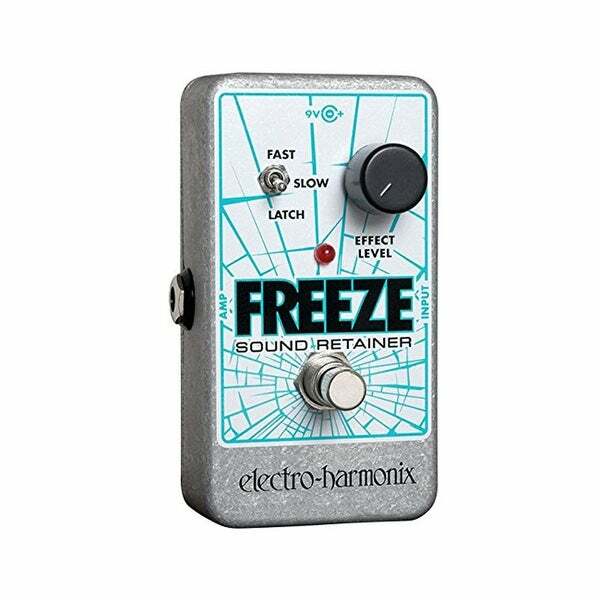 Then you need the Freeze pedal from Electro-Harmonix! Check it out: you can pluck a note or strum a chord, stomp the Freeze pedal, and hold a smooth-sounding, sustaining sample of that sound for as long as you want! Go with a long or short decay, or use the Latch setting to hold that sucker forever. Freeze is perfect for all kinds of styles; you can blend in the effect just the way you want it and go from tasteful self-accompaniment to over-the-top sustaining madness. It works well with other pedals too! Basic Care for Musical Instruments: Amplifiers from Overstock.com. Our guides provide customers with information about basic care for amplifiers.